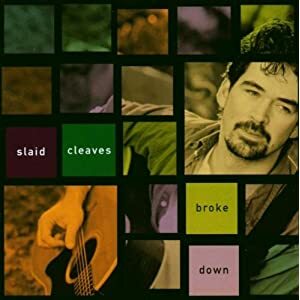 Slaid Cleaves is an Austin based by way of Washington DC and Maine singer/songwriter who released one of the best records of the past twenty years. That record is Broke Down. Released in 2000 on the heels of Cleaves’ debut No Angel Knows and at the height of the Pat and Cory phenomenon, Broke Down managed to find a large audience and great critical acclaim. The album and Slaid were universally embraced and accepted into the Americana hierarchy and with good reason. The collection of tunes produced by Gurf Morlix was a revelation. The songs were full of classic romantic tragedy, but audiences responded with (at that time) the type passion and fervor solely reserved for a Pat Green Billy Bob’s show. Despite the downtrodden and depressing nature of much of lyrical content, the record was still popular due to its emotional heft and power. Cleaves managed to be a folksinger who was seen as hip, yet still maintain his Americana street cred. Perhaps the most well-known track off this album among most Texas Music aficionados is “Horseshoe Lounge”. An ode to the famed watering hole in Austin, Cleaves spins the yarn of a man who spends his nights down at the ‘Shoe peeling labels off his Miller Lites and pondering where his relationships failed. Continuing the theme of the downtrodden and hopeless, Cleaves has the protagonist of “One Good Year” begging for a positive 365 days after so many days of failures. The most upbeat song on the album is “Bring It On” as Cleaves introduces us to a character that has finally had enough and despite life continually raining down around him, he challenges life and Mother Nature to bring on more because he’s now confident he can handle it. “This Morning I Am Born Again” is a song where Cleaves takes lyrics from Woody Guthrie and along with Morlix pairs the words with the type of rootsy, groove-laden production that is now en vogue with artists such as Jason Eady, The Trishas and Kevin Welch. Other standout tracks are “Lydia”, “Breakfast in Hell” and Del McCoury cover of “I Feel the Blues Moving In”, but really there are no throwaway tracks and each one contributes to the overall theme and identity of the album. Cleaves and Broke Down arrived at a time when Texas Music was experiencing one of its growth spurts and managed to remind everyone that lyrics are just as important as having a good time. The earthy and rich production touches Morlix provided became a signature sound that many other Americana and Texas artists would attempt to recreate in the ensuing decade. This isn’t music for everyone with the Irish folk elements and stark themes, but Cleaves thoughtful songwriting and ability to tell a story make him a strong link in the long line of great Texas songwriters (despite originally being from Maine/DC)…falling somewhere on the chronological timeline between Keen and Bingham. Slaid Cleaves is still out there touring and releasing great music, but his 2000 output remains a landmark. For these reasons and more Slaid is a Texas Treasure. Hi there, i read your blog from time to time and i own a similar one and i was just wondering if you get a lot of spam remarks?If so how do you stop it, any plugin or anythingyou can suggest? I get so much lately it’s driving me mad so any assistance is very much appreciated. I just want to say I am all new to blogs and really savored this blog site. Very likely I’m going to bookmark your website . You surely come with wonderful writings. Thanks a lot for revealing your web site. This is a great post and I rejoice that I located your website. I have actually been searching for details on this topic for the last few days as well as was happily amazed to locate it on your website. I intend to be back over the following couple of months to see if you have any type of other pieces of info that can help me. Thank you for every other informative website. Where else may just I am getting that kind of info written in such a perfect method? I’ve a mission that I’m simply now running on, and I have been at the look out for such info. I¡¦ve read some just right stuff here. Definitely price bookmarking for revisiting. I wonder how a lot effort you place to create this type of excellent informative website. Thank you for sharing superb informations. Your website is so cool. I am impressed by the details that you¡¦ve on this website. It reveals how nicely you perceive this subject. Bookmarked this web page, will come back for extra articles. You, my friend, ROCK! I found simply the information I already searched everywhere and simply couldn’t come across. What a perfect site. Hello, Neat post. There’s a problem together with your site in internet explorer, could check this¡K IE nonetheless is the market leader and a huge component to other folks will pass over your fantastic writing due to this problem. I do accept as true with all the ideas you’ve introduced to your post. They are really convincing and can definitely work. Nonetheless, the posts are very brief for beginners. Could you please prolong them a bit from subsequent time? Thank you for the post. Texas Treasures is a series where we will profile artists, albums and bands that helped shape what Texas/Red Dirt music has become and whose contributions may be unknown, forgotten or overlooked.